Steep hillsides in Italian wine country. 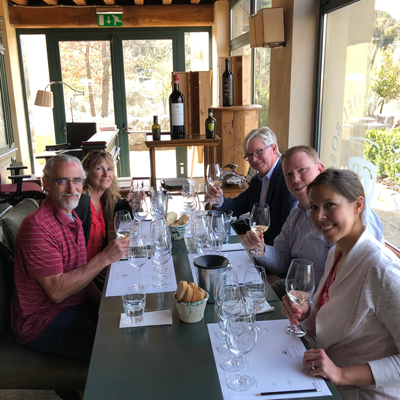 Grape growers Bill and Lisa Hendricks, Chateau Aeronautique Owner/Winemaker Lorenzo Lizarralde and Michigan By The Bottle Founders Cortney and Shannon Casey at Castiglion del Bosco, a winery in the Montalcino area of Italy. Before us was a very precise patchwork of rolling vineyards — dizzying in their sharp angles, dazzling in their appearance. More than once, we gasped aloud in awe. I’d so often seen those vineyards in textbooks, but experiencing them in person was sheer magic. This year marked the third time our friend Lorenzo Lizarralde, owner and winemaker at Chateau Aeronautique in Jackson, has invited my husband, Shannon, and me on a European wine adventure. Lizarralde’s goal is to become more educated about Old World-style wines to inform his own winemaking here at home. Joining us on the trip were Lisa and Bill Hendricks, owners of Glaciers Edge vineyard near Brighton, who supply grapes to Lizarralde and other Michigan winemakers. Between us, we represent three facets of wine from start to finish: the grape growers, the winemakers, and the sommeliers/wine merchants. The past two years, we’ve visited Champagne and Bordeaux, France. But this year took us in a different direction: to the Tuscan and Piedmontese wine regions of Italy. Silvia Altare telling the story of her family’s winery, Elio Altare, in Italy’s Piedmont region. In Piedmont, the ultra-tannic Nebbiolo reigns supreme, utilized in the famed Barolo and Barbaresco wines. Also prevalent are Barbera (one of my personal all-time favorites) and Dolcetto, typically made into more “everyday” type wines. In Michigan, Mari Vineyards — which uses a unique “nellaserra” hoophouse system to extend the growing season on the Old Mission Peninsula — grows a handful of Italian varietals, including Nebbiolo and Sangiovese. Leelanau-based Ciccone Vineyard and Winery, with its Italian roots, also has long grown Dolcetto. Otherwise, these grapes aren’t commonly seen in our state. 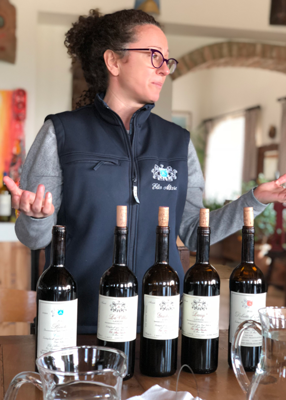 Cortney Casey tasting wines at Massolino, in the Piedmont region of Italy. While reds are the focus in Tuscany and Piedmont, the occasional white can be found. We tried some Chardonnays and Chardonnay-based blends, and also encountered a handful of Rieslings, which surprised us. At Massolino in Serralunga d’Alba, for instance, they had just harvested Riesling for the first time in 2017. Our guide, Alessandro, told us they were aging some in cement (seen occasionally in Michigan) and some in neutral terra cotta (which we’d never seen before) as an experiment. 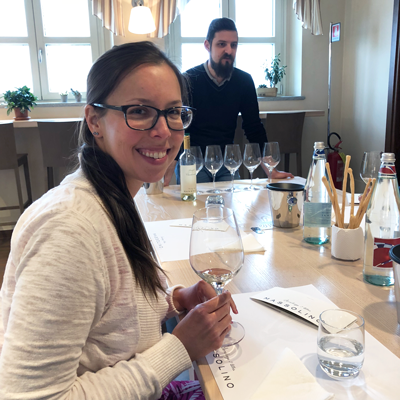 While in Italy, we also sampled some Franciacorta and Alta Langa — Italian sparkling wine — and some divine dessert wines: Moscato passito, Dolcetto passito, and vin santo (from Sangiovese), made from dried grapes, concentrating the sugars. 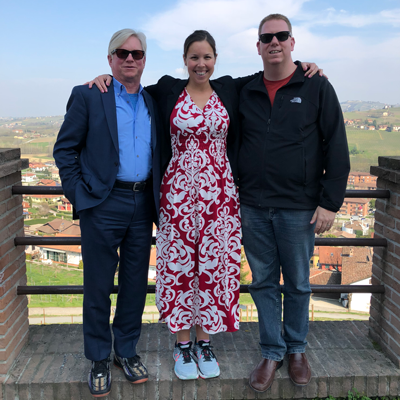 Chateau Aeronautique Owner/Winemaker Lorenzo Lizarralde and Michigan By The Bottle Founders Cortney and Shannon Casey in the village of Neive, in Italy’s Piedmont region. As with its fellow Old World wine neighbor, France, there is much more regulation in Italy than in North America — the veritable “wild wild West” of grape production and wine labeling. 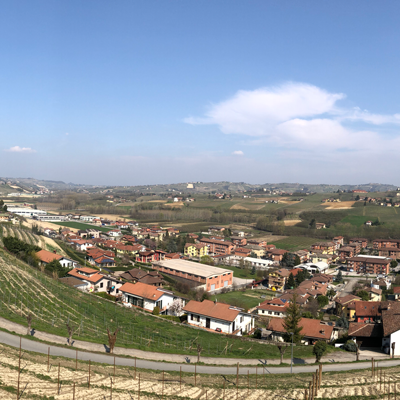 Government regulations determine which Nebbiolo, for instance, is suitable to be dubbed Barolo, and which must be “declassified” to the “lesser” designation of Langhe Nebbiolo, based on a variety of factors such as which direction the vineyard slope faces. Also as in France, the very best wineries in Italy — despite the difference in grapes — reminded us of the very best in Michigan: staffed by people who are dedicated to their craft and committed to letting the fruit speak without pronounced intervention, convinced that most of the work is done in the vineyard rather than in the winery. 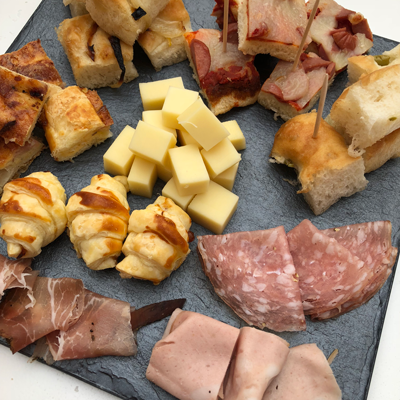 A typical platter of snacks served with wine at Al Mido della Cinciallegra, a wine bar in Neive, in Italy’s Piedmont region. The winemakers and winery owners seemed pleased to have guests who were as enthralled with wine as they were, who wanted to know about things like the soil, climate, and winemaking techniques and challenges. They were also curious about Michigan’s grapes and growing conditions, and eager to try Lizarralde’s wines, which he gifted to the winemakers. 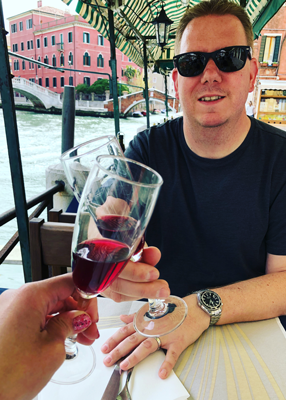 One of my favorite things about Italy was how much of a fuss was made about wine and food, no matter where you went — whether it was a winery, a bar, a restaurant, or a bed-and-breakfast. There, wine and food is life. It is abundant; it is celebrated. At most of the wine bars we visited, snacks were automatically part of the package when we ordered wine — usually for a nominal automatic service fee of 2-3 euros. Along with the wine, the server would bustle over with a platter piled with small bites, never asking whether we actually wanted it. The offerings ranged from salami, prosciutto, and various cheeses to little chunks of pizza (sometimes, mystifyingly, topped with sliced hot dogs) to potato chips and peanuts — and bread. Always bread. It’s evidence of a lifestyle where wine and food are considered inextricably linked, and where kicking back with wine for an extended experience is just part of everyday life. Flying on a pilot’s buddy pass is always an adventure within an adventure. Since you’re technically standby, you’re never sure if you’ll even be able to get on the plane. For the first time in our trips with Lizarralde, four of us got “stranded” in our final stop, Venice, for a few extra days because our original plane filled up. Cortney and Shannon Casey toasting an extra day in Venice. The complimentary greeting aperitif was a local cherry wine — made us think of home! The day we got “left behind,” Shannon and I headed back to Venice from the airport and grabbed lunch at a charming little place called Rio Novo. We sat in a booth along the canal and gleefully mowed our way through a caprese salad with buffalo mozzarella (so fresh and creamy that it nearly made me tear up) and huge, steaming, made-to-order pizzas. We ordered a carafe of their house red wine for 8 euros to wash it down. (Point of reference: a 1-liter bottle of water often was around 4 euros.) Though we splurged on many amazing bottles of Barolo, Barbaresco, Chianti, etc., throughout the week, enjoying this simple, inexpensive local wine was one of my fondest memories of the trip. Wine is all about a sense of place. 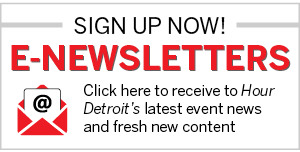 It’s as true here in Michigan as it is in the hills of Tuscany, in the grand châteaux of Bordeaux or in the caves of Champagne. While in Italy, I most enjoyed sipping the wines made from grapes grown mere miles away. It’s similar at home; I still drink wines from all over the world, but here, I get the most pleasure out of drinking wine made from Old Mission Peninsula grapes while overlooking Grand Traverse Bay, or Lake Michigan Shore grapes while gazing out over southwestern Michigan’s vineyards — always traveling, but always coming home.